Since the end of World War II, the United States, through the founding of the United Nations and NATO, has participated in a wide range of international organizations which can, but sometimes do not, serve the cause of peace and prosperity. While acting through them, our country must always reserve the right to go its own way. There can be no substitute for principled American leadership. 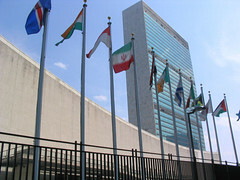 The United Nations Population Fund has a shameful record of collaboration with China’s program of compulsory abortion. We affirm the Republican Party’s long-held position known as the Mexico City Policy, first announced by President Reagan in 1984, which prohibits the granting of federal monies to non-governmental organization that provide or promote abortion. Under our Constitution, treaties become the law of the land. So it is all the more important that the Congress—the Senate through its ratifying power and the House through its appropriating power—shall reject agreements whose long-range impact on the American family is ominous or unclear. These include the U.N. Convention on Women’s Rights, the Convention on the Rights of the Child, the Convention on the Rights of Persons with Disabilities, and the U.N. Arms Trade Treaty as well as the various declarations from the U.N. Conference on Environment and Development. Because of our concern for American sovereignty, domestic management of our fisheries, and our country’s long-term energy needs, we have deep reservations about the regulatory, legal, and tax regimes inherent in the Law of the Sea Treaty and congratulate Senate Republicans for blocking its ratification. We strongly reject the U.N. Agenda 21 as erosive of American sovereignty, and we oppose any form of U.N. Global Tax. We oppose any diplomatic efforts that could result in giving the United Nations unprecedented control over the Internet. International regulatory control over the open and free Internet would have disastrous consequences for the United States and the world. To shield members of our Armed Forces and others in service to America from ideological prosecutions overseas, the Republican Party does not accept the jurisdiction of the International Criminal Court. We support statutory protection for U.S. personnel and officials as they act abroad to meet our global security requirements.